This post could be titled no-bake and no-recipe required. I am sharing three "recipes" with you today. 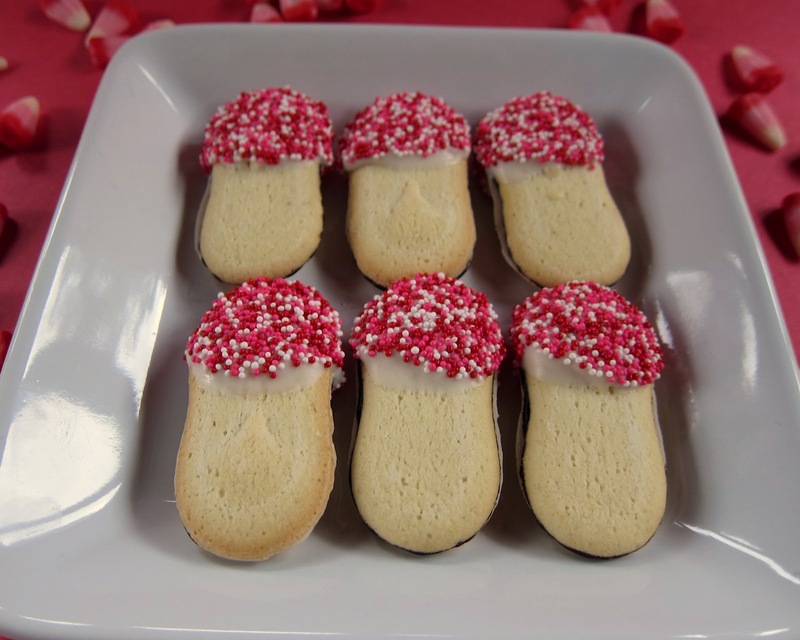 First up we have these cute Valentine whoopie pies. 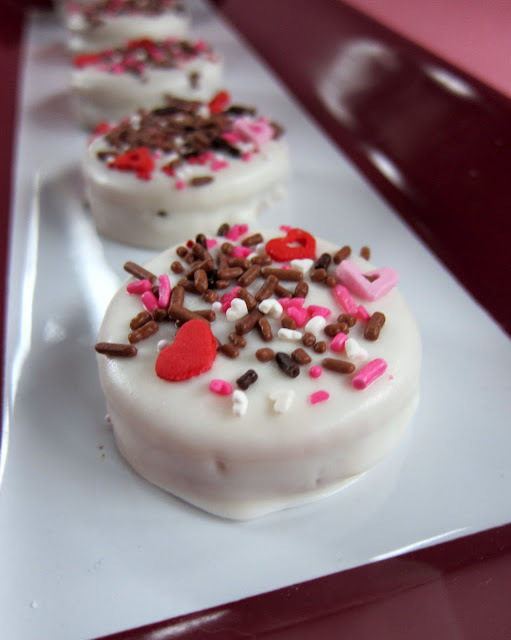 They are actually Oreo Cakesters cut into heart shapes with a cookie cutter and rolled in Valentine sprinkles. So cute and so simple. Next up are Double Dipped Milano cookies. I used a bag of Pepperidge Farm Mint Milano cookies and dipped them half way into vanilla almond bark and then into some festive Valentine sprinkles. Super easy! Finally we have Biscoff Ritz Cookies. Ritz crackers with Biscoff spread and dipped in almond bark. This was my favorite treat. These cookies call to me. Sweet and salty goodness! Spread some Biscoff spread on half of the Ritz crackers. Top with remaining crackers to make a sandwich. Melt the almond bark in the microwave, stirring every 30 seconds until it’s melted and smooth. Dip each sandwich in the melted almond bark, turning to coat. Place on wax paper and add sprinkles if desired. Allow to cool for about 20-30 mins before serving. Love these quick treats! Bravo on the Ritz cookies, very similar to the pb ones I grew up with but I love your spin with the Biscoff spread. the biscoff ritz cracker combintion looks fantastic! i love biscoff cookies in general, so I can't imagine that this would be anything less than super-tasty. I found the biscoff spread in the peanut butter aisle at the grocery store. Target also sells it. Thank you for this idea!!! My son's 3 yr old class did this for their Valentine's Party today! My name is Elena and I am curating a collection of Valentine’s Day recipe/treat ideas for Looksibite(dot)com. I don’t know if you’re familiar with Looksi but it’s a lot like FoodGawker: they display a thumbnail image from your blog along with a short description and a link back to your original project. Typically you would submit your own images (like you do on FoodGawker) but they also have curators (such as myself) who do theme based round ups. I think your Milano cookies would be perfect for my collection which will be published this Friday. Please let me know if you *don’t* want it included so I can remove it.